SciTeeX cordially invites you to take part in the Exhibition of Corrosion Protection Technology and Surface Treatment EXPO-SURFACE in Kielce in March 2012. At the exhibition you will find a lot about technologies and appliances for protective coating applications. Leading European companies will present their systems and equipment for surface cleaning and preparation. The 2011 edition was attended by 5 thousand specialists and the number has been growing by ca. 20 % a year. We look forward to meeting you at this fair. 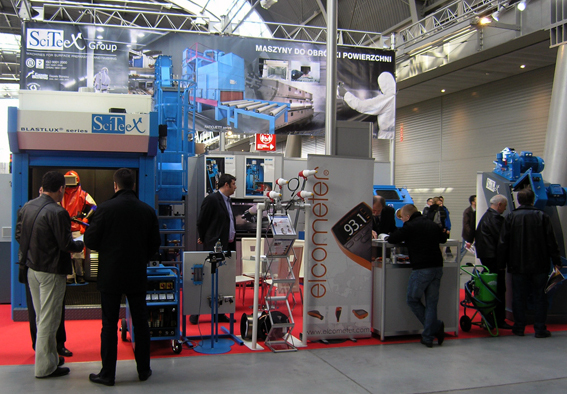 SciTeeX Group has exhibited for the ninth time at the Fair EXPO SURFACE in Kielce. Surface Technology 2015 at the Hannover Messe, the largest industrial fair in the world.